The Staff Report addresses concerns raised by citizens in public hearings on Nov. 14 and Dec. 6, calling them “understandable” but dismissing them in the end as unfounded or inconsequential. The report says that the request for special use approval for the solar farm is consistent with the changes in the zoning laws made by the Board of Commissioners on March 1 of 2016 to allow solar farms on agricultural land. The report says it is “difficult to fully examine the compatibility of this use” with the county’s Comprehensive Plan, but, “if properly screened and maintained, the proposed solar energy farm may not negatively impact established residential development” nor prevent such development in the future. The language in the report regarding the Comprehensive Plan is the most responsive to the concerns expressed by residents at the Planning Commission hearing on Nov. 14 and the Board of Commissioners meeting on Dec. 6. The Planning Commission voted 5 to 0 against recommending approval of the request for special use approval for the project, and the Board of Commissioners postponed a decision at the Dec. 6 meeting until Tuesday night, when the Board will have a new Chair and two new members. Chair John Daniell will replace Melvin Davis, who was a strong behind-the-scene proponent of the project. Mark Thomas will replace Jim Luke, who retired Dec. 31 but who recused himself from the discussion on Dec. 6 because his wife owns property in the area. Chuck Horton will assume the Post 2 slot, made vacant when Daniell stepped down to run for the Chair position. Mark Saxon and William “Bubber” Wilkes voted at that Dec. 6 meeting to delay a decision on the rezone request until Tuesday night. According to Planning Department records, the proposed solar energy farm is in close proximity to 9 residential subdivisions with some form of construction underway and one dormant or inactive residential subdivision. I created the chart below based on documents I obtained from the Planning Department. A total of 922 dwelling units or lots are included in the nine active projects, including 193 at Georgia Club South and 173 at Wildflower Meadows. Wildflower Meadows, approved by the BOC in a rezone decision in 2006, runs along the entire northern edge of the solar farm property, with lots backing up to the proposed acreage for the solar farm. The first phase of the U-shaped development is well underway. The county has issued 31 building permits for Wildflower Meadows, including 14 in 2016. Williams and Associates Land Planners, representing Mr. Chick Farms, has submitted revised plans for the project, dropping a parcel east of and south of McNutt Creek Road from the plans. That parcel, which I labeled Prather on the map, is up against Belfair subdivision, the source of much of the opposition to the project. Rural Green Power LLC, with an Athens postal address, is to be the developer of the $50 million solar farm project, according to the rezone narrative. Don Hammond of Gainesville owns what was described as a 199-acre parcel west of the intersection of McNutt Creek Road and Dials Mill Road north of U.S. 78, under the name Mr. Chick Farms Limited Partnership of Gainesville. The revised Staff Report lists that property as 204.8 acres. Eleanor Prather of Good Hope, in Walton County, owns the 39 acres dropped from the current plans. The staff report lists five citizen concerns: Toxic Materials, Property Valuation, Adverse Health Effects, Benefits, and Decommissioning. The staff report cited the analysis by Oconee County Chief Appraiser Allen Skinner that the project would generate $129,933 in personal property taxes. It acknowledged that the personal property, i.e., the solar panels, would depreciate every year for 17 years until they reach 20 percent valuation and then remain at that level. The report said it could not find any “peer-reviewed papers studying adverse health effects on humans or animals” of solar farms. The Staff Report cited the tax revenue as a benefit as well as the benefit of switching from fossil fuels to renewable energy. The staff recommended that a condition be added to the rezone specifying that the Board of Commissioners will have to approve a decommissioning plan for the project prior to operation of the plant. The Board of Commissioners is about to begin a two-year process of updating its 2030 Comprehensive Plan, and the staff report notes that the existing Plan, adopted in 2008, did not anticipate solar energy farms. 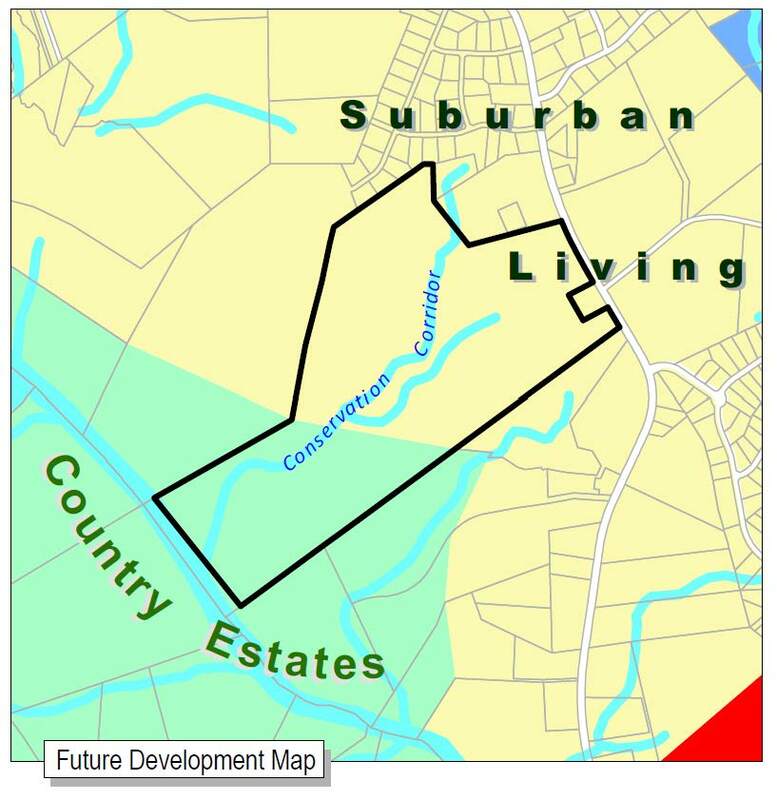 The existing Comprehensive Plan, with its Future Development Map, designates the land including and surrounding the proposed solar farm as Suburban Living and Country Estates. Country Estates is to provide a transition between the more rural areas of the county and traditional suburban residential development, according to the Staff Report. 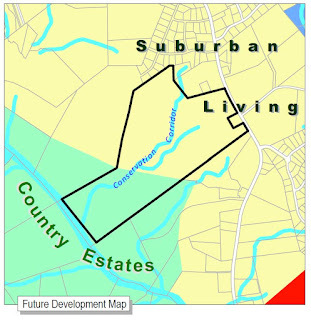 The Suburban Living character area includes established suburban neighborhoods in conventional subdivisions and master planned developments, according to the staff report. “It is difficult to fully examine the compatibility of this use with the Comprehensive Plan as solar energy farms were not an anticipated use when the Comprehensive Plan was adopted in 2008. 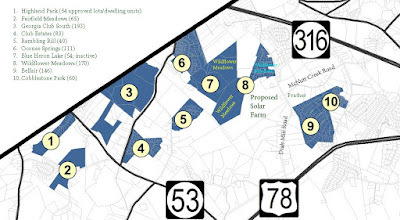 Most of Wildflower Meadows, and most of the proposed acreage for the solar farm, is in the Suburban Living category of traditional residential neighborhoods. More than any other existing residential project, Wildflower Meadows will be affected by the solar farm, with many of the residences literally looking down on it. Abe Abouhamdan, whose firm Abe Consulting is the engineering and design firm representing Wildflower Meadows developer Ellington Farms Development Partners, has raised concerns about the solar farm both at the Planning Commission and before the Board of Commissioners. Abouhamdan also is chair of the county’s Citizen Advisory Committee on Land Use and Transportation Planning and bids on and has received design contracts from the county for road design and other work. Mark Jennings is the registered agent for Ellington Farms Development Partners, according to the Georgia Secretary of State database. The address is 2300 Pete Dickens Road, Bogart. Larry Christopher was listed as the registered agent when the company was formed in 2009. This STILL DOES NOT address the fact that Oconee County would gain zero electricity from this project but rather Hall and Barrow County will instead. Also, I see no business case analysis showing net results of tax revenue from homes in that space vs. the solar plant. We stand to gain more from houses over the long term. In my opinion, there has been zero demonstration as to why this is good for OC. So far the arguments are only why it isn't bad. ZERO true net benefit proven...Vote NO. This may sound crazy, but why doesn't the solar farm install somewhere that the land is already cleared, like a mall parking lot? A mall could provide shaded parking for patrons while gaining income from the solar panels, unless solar panels do indeed pose a health threat. If you read the revised staff report from the planning commission, you will see that Williams and Associates were kind enough to write the recommendations into the report, along with discrediting the homeowners and county residents. All information obtained in favor of this project, was obtained from "solar energy publications". In here it states that subdivisions like Georgia Club (estate living), will "blend" in nicely with low impact solar panel factories. The commission failed to answer the question, "Do you get a free drop if you hook your ball into the field, or do you play it as it lies?" So the way was being paved for this project quite a while before it was announced -- "changes in the zoning laws made by the Board of Commissioners on March 1 of 2016 to allow solar farms on agricultural land." What was that old song -- "no one knows what goes on behind closed doors:. The newly revised staff report states that this $50,000,000 facility will produce enough energy to power 2,800 homes. Studies show that north Georgia average sunshine would only generate power 3.5 hours per day. $50 million for $2,800 homes and it only works 14.5% of the day? County employees - Zero / Power to county - Zero Likelihood of something like this being proposed next to your subdivision - HIGHLY PROBABLE! I like your idea, Dark Horse, of putting a solar farm in a mall parking lot - saves trees, provides shade. As far as tax benefits, houses never pay enough taxes to overcome the amenities required - schools, roads, police, sewer, power, parks, etc., etc. The solar farm will generate tax income and require no amenities so I see it as a win from the tax standpoint. We have solar power and it runs all day long on sunny days which we have had a lot of this year in GA. It has lowered our power bills by almost 70%. It is quiet, low maintenance, and I certainly don't worry about health effects (especially as compared to coal or nuclear and we do need power). I just wish everything had been out in the open from the beginning, very unfair move to insert solar farms into agricultural zoning in UDC without pointing out this change. As Mr. Page has repeatedly said, agricultural zoning should be clearly defined. When Abe Abouhamdan is concerned about a development project, then ya really know something crazy is going on!! Williams said that the county would reap $300,000 extra a year in taxes with no impact on schools or services. He anticipates it being a draw for people and firms who support green energy. He said he had studies that say property values are not diminished. "The Oconee County Planning Commission on Nov. 14 voted 6 to 0 not to recommend to the Board of Commissioners the special use for the solar farm, following comments from citizens raising a number of concerns about negative impact of the project on nearby residential neighborhoods. On Nov. 28, Davis asked Allen Skinner, chief appraiser with the Oconee County Property Appraisal Department, to do an analysis of the tax impact of the solar energy farm." At the November 6th meeting, Williams stated again that the project would generate $300k annually. Davis had the report from Skinner at the time and failed to challenge him. Don't forget that this program has a 5 year accelerated depreciation, so there is no 17 years of depreciation. Come to the meeting Tuesday night. It is going to be interesting. Great point by Randy Jackson about Melvin and the tax revenue numbers. Big difference between $300k and $122k. For those of us with kids and other responsibilities and can't attend every meeting in person, would sure be great if our own county operated in the 21st Century and live streamed commission meetings. Thankfully Lee, Russ and Sarah will record most meetings and post them later, but they absolutely should not have to do so in the year 2017. C'mon John Daniell, get the meetings online!!! - This was all done in secret: False. The BOC held two hearings on the changes to the UDC and the Planning Commission held a hearing on the changes. The meetings were open to the public, so if you didn't know about it, it's because you didn't bother to show up! - This solar farm won't produce power for Oconee County: False. All electricity goes onto the electrical grid, and that power is used in a "just in time" (meaning power is always being produced and made available for your use at any time.) You use power that is generated in other parts of the state; power from this site will be used where needed, and that may include Oconee County. - Houses produce more tax than solar panels: False. Solar panels do not send kids to school, they do not call for sheriff protection, and they do not use water/sewer services. They consume zero resources. Each house may produce $2000-$3000 in taxes per year, but each kid in our school system costs $8000 per year to educate. In order to reach the $130k tax generation produced by the solar farm, a subdivision would require 50 homes using no sewer services and homeschooling all of their kids. County Staff/Officials did something illegal by meeting with the solar farm people - False. The landowner obviously had property in Oconee County, therefore he is a constituent. Constituents are allowed to meet with elected officials and county staff for any reason, especially if they have a concern regarding their property. It is completely legal for these types of meetings and discussions. If you thing Melvin Davis acted inappropriately for facilitating this solar farm, you are welcome to that opinion... But saying he or the county staff did anything illegal for simply meeting with someone is Slander/Libel. Commentors take note: it's one thing to be pro-active in county affairs because you care about the community... but it's quite another to write falsehoods simply because you are angry about change. Go to commission and committee meetings and get involved... But don't tear down good people simply because you don't like or agree with what's going on. You are better than this - act like it! As I have noted in my posts, the UDC changes were discussed at both the Planning Commission and at two Board of Commissioners meetings. I also noted that the landowner is local by virtue of owning the land and the developer lives in Oconee County. When staff and Commissioners met with these people, they were meeting with taxpayers in the county. I reported the address of the developer to make just that point. Those interested in watching the PC and BOC meetings can go to the two channels I have created on vimeo for meetings I have uploaded. Videos of all three of the meetings are on those channels. Wow, Anon 11:53 AM is fired up. Regardless, Davis and White made changes to the UDC to benefit a specific project that was over a year away from being presented to and approved by the Planning Commission and Board of Commissioners. Even with the UDC meetings, the actual solar farm poliy changes weren't exactly well publicized. Well, apparantly we need to read every word of the 631 page UDC to find any changes. Melvin, White and other county officals knew the proposed location of the solar farm. I'm guessing if the surrounding residents knew of the proposed location AND the UDC solar farm policy changes, there would have been very close attention paid by the surrounding county residents/taxpayers. Sunlight, y'all, sunlight. Not sure why Jon Williams would state at a public meeting that the solar farm would generate $300k in tax revenue, but Oconee County Chief Appraiser Allen Skinner had it generating $129,933 and then depreciating every year after. Big difference there, especially when multiplied over 5-10-20 years. The Planning Department staff report is heavily skewed in favor of the solar farm, with no project negatives listed...zippo. A fair and balanced staff report should have absolutely identified some negatives related to the project. Sorry Anon 11:53 am; it's more than fair to say that this project deserves very close scrutiny. Does anyone have any concern that this is a variance request that sets a precedence of allowing a massive business in a rural or suburban district? This might be a little different if it were in a more rural less populated part of the county, or if it were an individual asking for solar panels for their individual house or a subdivision that was advertising solar power for the homes within the subdivision. What happens when someone wants to put a wind farm next door or a methane reclaim farm supplied by chicken or hog waste? Maybe there needs to be a little more discussion and investigation before this is passed. 1) Melvin Davis knew of the solar farm plan for that location in January 2015. 2) The surrounding residents found out about it in late Fall 2016. 3) The county Planning Commission voted against it 6-0. "The Oconee County Planning Commission on Nov. 14 voted 6 to 0 not to recommend to the Board of Commissioners the special use for the solar farm, following comments from citizens raising a number of concerns about negative impact of the project on nearby residential neighborhoods."